Why make a new album of BABES IN ARMS? This Rodgers & Hart show, a virtual songbook of their best, has been recorded at least twice before - and yet there has never been a Broadway or Off-Broadway revival of Columbia studio recordings. Then, in the late '80's, when the original orchestration movement was in full swing, an album was made by New World Records using Hans Spialek's original orchestrations and based on a one-night concert performance. First-rate musical theatre performers were used that time too, including Judy Blazer, Judy Kaye, Jason Graae and Gregg Edelman. Lord knows the songs from BABES IN ARMS have been recorded time and time again. It would be a large task to list all the various recordings. How many have recorded ""My Funny Valentine""? Although Frank Sinatra seemed to have a lock on ""The Lady Is A Tramp,"" it, too, has been sung by many singers through the years. ""Where or When?,"" ""Johnny One-Note""... You get the idea. But there's been one lingering question about BABES IN ARMS, the show. It was written to be performed by a very young cast, and yet its score is full of amazingly sophisticated songs. Why? What was the point being made, and more importantly, what did an audience feel hearing these songs for the first time as they were being sung by virtual teenagers? When Encores! decided to present BABES IN ARMS last year, the creative forces behind the presentation made a decision to cast the show young. Whatever the specific ages of the performers, what came across in Kathleen Marshall's directorial debut was what I believe to be the essence of BABES IN ARMS in 1937: youthful energy, earnestness and enthusiasm. Every member of the cast approached the show with total conviction. They made us believe every word. They were kids caught up in the spirit of ""come on, let's put on a show in the barn!"" And put on a show they did. They were assisted ably by the music department. The first thing to be learned from using original orchestrations from the 1930's is how well they serve the music. The orchestras were larger then, the orchestrators were well schooled in all forms of music, including classical, and very savvy in the use of instruments allocated. But a second thing to realize is that these songs were meant to be performed. The musical theatre of the 1930's relied on personalities, even when the performers weren't stars; sometimes even the melodies were written more to let lyrics tell the story than soar on their own. In short, they need to have personality injected. Just playing the original orchestrations often doesn't give you the full picture. Musical maestro Rob Fisher has learned how to shape music from old shows both to honor what's on the page and encourage what the performers can add. Confession: there are a few cuts and choices made on this album. But that has to happen anyway, since no set of original orchestrations tells the whole story. And a word about the Coffee Club Orchestra: This assemblage of first-rate players has become an ensemble without peer. They play as one and their group instincts are uncanny. We owe them a lot. So those are some of the reasons why there is a new album of BABES IN ARMS. It came out very well indeed, and I feel it adds to the ever-thoughtful question of what these shows felt like when they first were produced. It may be presumptuous to say, but I think Hugh Fordin's DRG recording comes as close as any album I know to capturing a show's initial spirit. 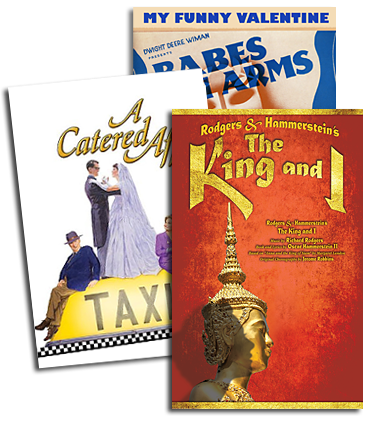 The 1999 New York cast recording of BABES IN ARMS is currently available at all major music outlets or by calling 1-800-LUV-4-DRG...For further information visit www.drgrecords.com... R&H Theatre Library customers should note that several versions of BABES IN ARMS are currently available and can be licensed at this season's ""Spotlight"" discount; contact The R&H Theatre Library by phone (212-564-4000), fax (212-268-1245) or e-mail (theatre@rnh.com).